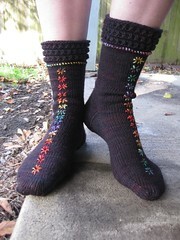 Welcome to the 9th month in the Socks For All Seasons Pattern club! We have options for you this month. 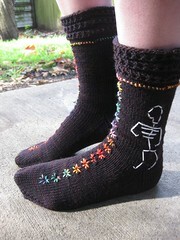 The pattern is written for multiple gauges and you can knit the sock as is, or add embroidery when done! Day of the Dead (Día de los Muertos) is a holiday to be spent gathered with family and friends to remember loved ones who have died. The celebration occurs on November 2 in connection with the Catholic holidays of All Saints' Day (November 1) and All Souls' Day (November 2). Traditions connected with the holiday include building altars honoring the deceased using decorated sugar skulls, marigolds, and the favorite foods and beverages of the departed. The Day of the Dead is not a time for mourning, so knit and decorate these socks using bright, festive colors and wear them to party. 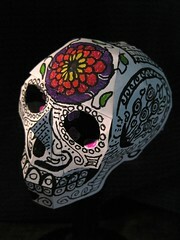 At the end of the pattern you will find a sugar skull paper craft pattern. Decorate that too! These socks give the knitter options. 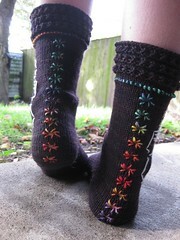 A simple sock can be decorated by embroidering marigolds along the eyelets. A skeleton can be embroidered along the side if desired. Foot circumference: 7 (8, 9, 10) inches 17.5 (20, 23, 25.5 cm) unstretched. Will stretch to fit 8 (9, 10, 11) inches 20 (23, 25.5, 28 cm). Yarn: This pattern is written for four gauges: (See yardage requirement chart to determine yarn selection) Sample shown: sport-weight: Blue Moon Fiber Arts Socks that Rock Mediumweight [100% SUPERWASH Wool; 380yd per 155 gram skein]; color: Pallas Athena: 1 skein. Needles: 1 set of 32” circular needles (magic loop), 2 sets of 24” circulars or double pointed needles in size to get gauge. Notions: Stitch markers, scrap yarn or embroidery floss, tapestry needle. Because of the large file size, this time the "extra" is in a separate pdf file. Both the pattern and paper craft are available to you through the link. Special thanks to Lorna for test knitting and Grant Law for the photos and the sugar skull paper craft. It is now Dec. 8. 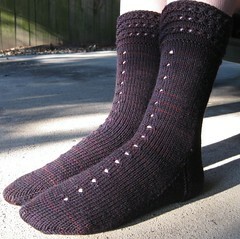 Any comments about your new sock pattern?